As we fall back into our autumn routines, try incorporating these 3 wholesome habits to set yourself up for a healthful and productive year. From glowing skin to digestion, drinking 2-3 liters of water a day is an essential part of our health. Yet many of us fall short of our hydration goal, choosing coffee or sugary beverages over a glass of water. This month, make it a priority to try and drink 8-10 glasses of water every day, and take note of how you are feeling – staying hydrated will not just help with weight control and nutrient absorption, but has been shown to improve concentration, energy, and even your overall mood! If you’re having difficulty keeping track of your water intake, make sure to check out our hydration guide. Preparing food in advance will provide you with accessible and healthy options all week long. This month, try preparing food each Sunday to last through the week – this can be as simple as slicing cucumber rounds so they are ready to dip in your hummus, to a fully prepared dinner meal, complete with pre-cooked quinoa, chicken, and roasted vegetables. Keeping these prepared options in your kitchen will take away the “what should I have for dinner” angst that we all get after a busy day. 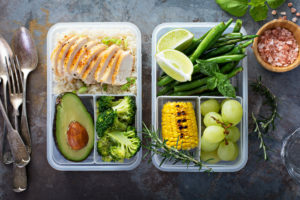 If you’re not sure where to start, go to our What’s Cooking page, or check out these 4 meal-prep tips from good friends over at Nutritious Life. After a long day and a filling meal, many of us just want to go to sleep; however, research has shown that taking a walk after dinner can help aid in digestion, regulate blood sugar levels, and burn a few extra calories before bed. But more importantly, walking after a meal can help with mental clarity as well – many of our days are filled with responsibilities and tasks, and setting aside 10 minutes at night to simply take a walk can clear your mind in a stress-free environment. Walking has also been linked to a boost in creativity and positivity, making it a win for both your physical and mental health.